Microsoft's 'Your Phone' app is just the start. Microsoft's new approach to mobile is pure pragmatism: Play nice with everyone, and get their users hooked on Microsoft apps. With the demise of Windows Phone -- a noble effort, especially after the 2011 Nokia partnership -- the company really has no choice. But now Microsoft is moving beyond merely getting its apps onto other platforms: It's integrating Android in Windows 10 with the "Your Phone" app, which gives you instant access to your mobile photos and text messages on the desktop. 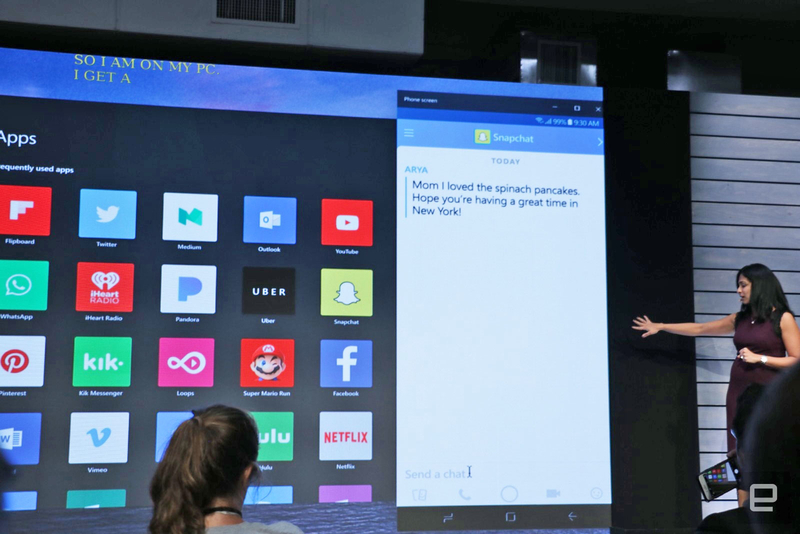 During its Surface launch event this week, Microsoft gave us a peek at something even more impressive: the ability to completely mirror your Android phone on Windows 10. All of a sudden, there's a much bigger reason for Windows users to avoid the iPhone. We don't know when that Android mirroring feature will arrive (we're still waiting on Sets, something Microsoft previewed a year ago), but the Your Phone app is readily available on the October Windows 10 update. Setting it up is surprisingly simple: install the "Your Phone Companion" app on your Android device, log in to your Microsoft account and give it permission to access your photos and text messages. Meanwhile on your PC, the connection pops up on the Your Phone app, and it then directs you back to your smartphone to secure desktop permissions to the same content. It's a bit confusing at first, but it's all in the name of security. The setup process worked smoothly for me at home, but I ran into a few snags on my work PC. Upon launching the Your Phone app, I saw a note that said I needed to approve the new machine on my phone. But I didn't automatically receive any permissions notification on my phone. Microsoft includes a handy button on the PC app to trigger that alert on Android, but it took several clicks before it popped up on my smartphone. Once the PC and Android sides are successfully connected, you'll see your smartphone's latest photos and text messages on the Windows app. 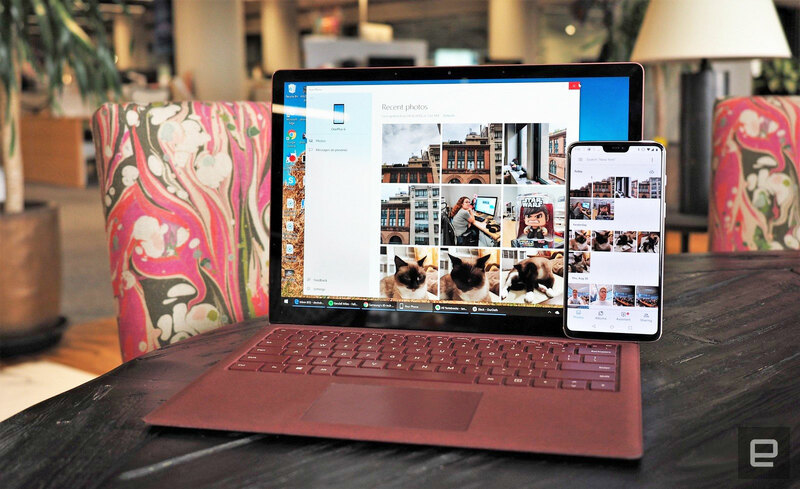 You can handle pictures like any file on Windows: Open them up in the Photos app; right-click to share with social networks, contacts, nearby PCs and other Windows apps; and, best of all, you can just drag and drop them wherever you want. There's a 10- to 30-second delay between taking a photo on your phone and seeing it on your PC, but it's pretty seamless otherwise, especially compared to waiting for iCloud photos to move between iOS devices and Macs. The text messaging integration is currently in preview and it's, pretty basic. You can send and receive message, but that's about it. Still, it seems useful for responding to friends without leaving your keyboard and mouse. When I first connected the Your Phone app, only my last text message appeared, but subsequent conversations showed up without issue. It takes 15 to 30 seconds for a text to appear on Windows, but replies from the Your Phone app showed up almost instantly on smartphones. I've longed for something like iMessage's seamless synchronization across iOS and MacOS, and Microsoft is close to matching that. Of course, the company's integration strategy goes both ways: Android users can also take advantage of the Windows 10 Timeline in the Microsoft Launcher, giving them easy access to websites and recently used documents from their PC. The Launcher, which is effectively a skin for Android, also puts all of Microsoft's products and services, like Bing and Office, front and center. With the addition of Timeline, it's now more than just a glorified ad for the company -- it's a way to make you more productive. But while Microsoft cozies up to Android, iPhone owners will lose out. There's some basic Timeline integration in Edge for iOS, but it's mainly relegated to showing you websites you've visited on your PC. And you can bet that Apple will never give a competitor deep access to photos and text messaging on iPhones (let alone seeing iOS mirroring on Windows). It makes sense for Microsoft to take advantage of Android's flexibility. And unlike the partnership with Nokia to make Windows Phone devices, Microsoft won't have to worry about building a huge ecosystem for Android -- it just has to build a more useful experience for the users already there.